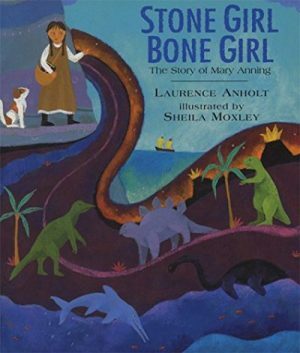 DESCRIPTION FROM THE PUBLISHER: Mary Anning is probably the world’s best-known fossil-hunter. As a little girl, she found a fossilised sea monster, the most important prehistoric discovery of its time. Best-selling author Laurence Anholt turns Mary’s fascinating life into a beautiful story, ideal for reading aloud. Sheila Moxley’s luscious pictures vividly evoke the coastal setting and the real-life dramas of this spectacular tale. IDEAS FOR USE: Have a go at our ‘make your own fossils’ STEM project!